"THANK YOU SO MUCH ELLIOT! THE BENCH YOU CLEANED LOOKS BEAUTIFUL AND YOU SAVED ME $1200.00, THAT WAS THE COST OF HAVING IT RECOVERED. THE CARPET LOOKS LIKE NEW AS WELL. THANKS AGAIN." "IT REALLY DOESN&apos;T GET ANY BETTER THAN THIS. I USED ATLAS FOR UPHOLSTERY CLEANING. THEY WENT ABOVE AND BEYOND THE CALL OF DUTY, MAKING THE COUCH LOOK PRACTICALLY BRAND NEW, WHILE BEING VERY PERSONABLE AND FRIENDLY. I WILL DEFINITELY BE GOING BACK TO THEM FOR CARPETS, OTHER UPHOLSTERY NEEDS, AND WINDOWS. THANK YOU SO MUCH TO THE OWNER AND THE WHOLE CREW! THIS IS WHY IT&apos;S SO NICE TO USE A SMALL LOCAL BUSINESS..."
We can clean couches, loveseats, chairs, ottomans, additional pillows, dining chairs, upholstered headboards, and even mattresses if needed. We can also apply FIBER PROTECTOR to any of these items to help lengthen the life of these items and to provide some insurance from difficult stains. We clean upholstery with a Truck-Mounted Machine which provides strong water pressure and High Heat. This is a wet cleaning method. Therefore make sure your upholstery can be safely cleaned using a wet method. We consider ourselves Intensive Upholstery Cleaners and a good part of the reason is the Upholstery Tool. It can really slice through soil and we believe it is superior to other upholstery tools. Below is a more detailed description of the Tools. The devices that touch your upholstery. I&apos;d like to describe these special and unique tools for both upholstery cleaning and carpet cleaning a little further than we did on the Carpet Cleaning and Area Rug Cleaning page in the "Superior Tools" section. With the use of these tools, you can thoroughly clean a carpet, an area rug, and clean upholstery and not over wet it! The tools are different from every other tool in the industry. Most of the other tools have one part that shoots the pressured solution straight down into the carpet and another part vacuums it up. The problem is that the pressured solution can hit the bottom of the carpet and no matter how powerful a vacuum is, it’s not going to extract it all. ​That’s why carpets and upholstery can take so long to dry! Because of this, inexperienced carpet cleaners often over wet a carpet and experienced carpet cleaners have to deal with the fear of over wetting a carpet. Dealing with this fear is such a waste of energy, especially when you need to have your attention on cleaning the carpet/upholstery and getting the best results you can. Well, the tools we use solve this problem. 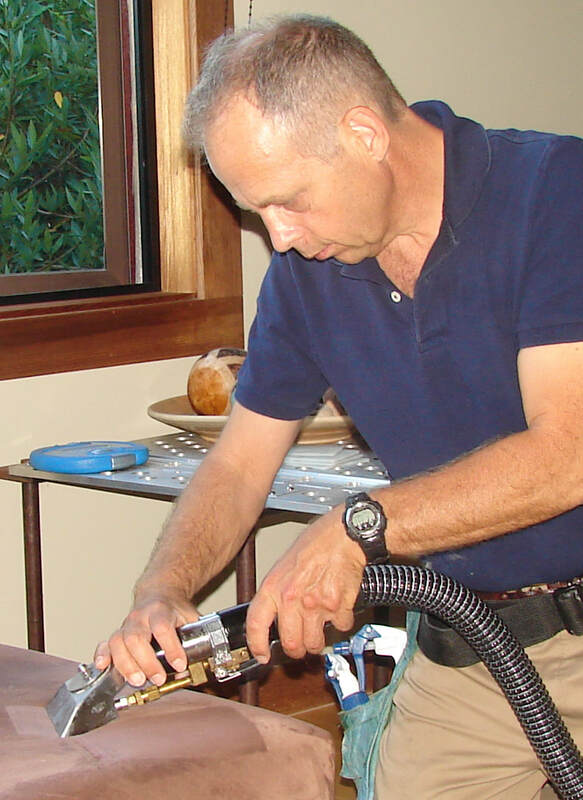 The tools have the pressured solution flowing through the fibers of the carpet/upholstery right into the vacuum. As the solution comes out of the wand, it makes a u-turn into the vacuum. In other words, the cleaning solution sweeps the soil right into the vacuum! Both parts (the pressured solution and the vacuum) work simultaneously! Why’s that good for you? If you have soiled areas that need a lot of attention, we can give it that attention without over wetting the carpet or the fear of over wetting the carpet. That frees us up to get the best results we can. These tools have been proven superior in soil removal. These unique tools costs us two to three times more than the traditional tools that most carpet cleaners use. Most carpet cleaning and upholstery cleaning veterans agree that these are the best tools that you can use to clean upholstery. This carpet wand can reach further under beds and furniture than traditional carpet wands. While other carpet cleaners shy away from soil filtration stains (those dark areas along the sides of stairways which are very difficult to remove), we have the ability to remove or at least reduce most of these types of stains because of these tools. With these tools, we can clean area and oriental rugs right on the floor and not wet the floor! Because of these tools, we can clean stair edges better than anyone out there!